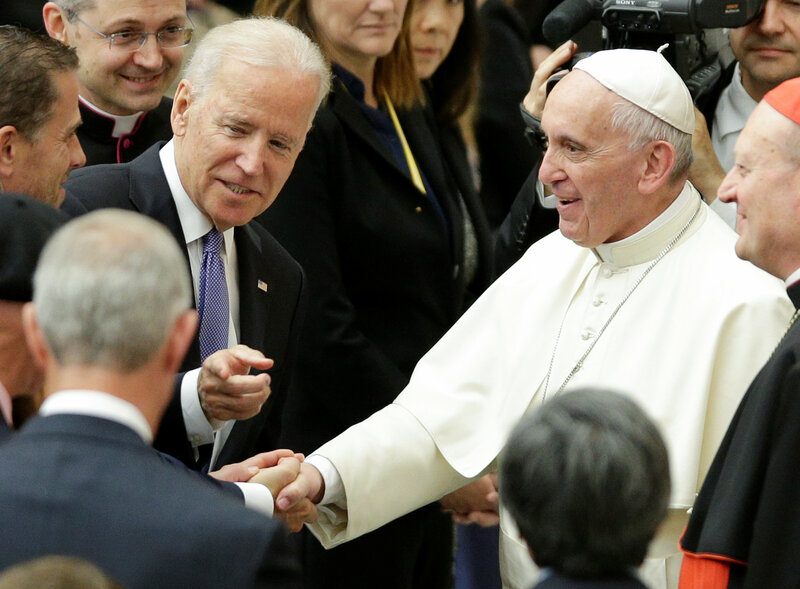 VATICAN CITY -- Casting cancer as a scourge with no boundaries, Vice President Joe Biden came to the Vatican on Friday to call for a global commitment to fund cancer research rooted in appreciation for the real people's lives that doctors and researchers hold in their hands. Biden, who lost a son to cancer last year, used his appearance at a Vatican conference on regenerative medicine to urge philanthropists, corporations and governments to increase funding and information-sharing in a bid to "end cancer as we know it." He said the world is on the cusp of unprecedented breakthroughs but not enough has been done. "Cancer is a constant emergency," the vice president said. "Cancer's not a national problem, it's an international problem. It's a human problem. It affects all races, all religions." Pope Francis spoke directly after Biden -- a particular treat for the Catholic vice president, Biden's aides said. With light streaming through stained glass into an ornate auditorium in Vatican City, the pope called for ensuring all have access to cancer care, stressing the need to combat a system that prioritizes profits over human life. "Research, whether in academia and industry, requires unwavering attention to moral issues if it is to be an instrument which safeguards human life and the dignity of the person," the pope said. CBS News correspondent Seth Doane says this was the third time the conference had been held at the Vatican, bringing together doctors, patients and philanthropists with religious and government leaders. Biden called it a gathering of "some of the most brilliant minds in the world." One of the topics of discussion was to be medical advances using adult stem-cell research. The Vatican opposes the use of embryonic stem cells. Before taking the stage, the pope greeted Biden privately in a room backstage, where the two exchanged small tokens, the White House said. The two were also seen smiling and chatting together as they greeted conference attendees after their speeches, joined by the vice president's surviving son, Hunter Biden, and son-in-law Howard Krein, a physician who's been involved in Biden's cancer push. The pope's focus on helping the less fortunate and the health of the planet has been welcomed by Biden and President Obama, who have made common cause with the pontiff on climate change, rapprochement with Cuba and the refugee crisis. Last year, Biden's eldest son, former Delaware Attorney General Beau Biden, died from brain cancer after his family's hopes of a last-minute medical breakthrough fell short. Months later, his father declared a "moonshot" to cure cancer when he announced he wouldn't run for president. Since then, Joe Biden has launched a task force with President Obama's blessing and the White House has asked Congress for $1 billion over two budget years for research. Only a fraction has so far been approved. While at the Vatican, Biden met with Cardinal Pietro Parolin, the Vatican secretary of state, at the gold-adorned Treaty Room of the Apostolic Palace. He was also to sit down with Italian Premier Matteo Renzi in Rome at Palazzo Chigi, the prime minister's residence, before returning to Washington. The vice president traveled to Rome from Iraq, where he paid a surprise visit Thursday to meet with Iraqi leaders about their political crisis and the campaign against the Islamic State of Iraq and Syria (ISIS).